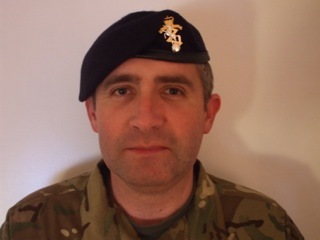 Craftsman Garry Freire is an Army Reserve soldier from 103 Bn REME embarking on his Trained Soldier Course (Alpha) (TSC(AO)) at Army Training Unit (South), Pirbright. He has six weekends to complete this part of initial training. Cfn Freire is a Policeman in his civilian life. Weekend 6 began in the same vein as the previous 5, with a very early start on Saturday morning. Once the shock of waking up had passed, it was time for the day’s lessons. We were all quite apprehensive throughout the weekend as we knew that it was the final TAB on Sunday. The TAB is the course output standard and if failed to finish in the given time we would have to go back to weekend 4 and try all over again! That was not a prospect any of us particularly relished. Saturday’s lessons were a mixture including values and standards, health and hygiene and an introduction to CBRN (Chemical, Biological, Radioactive, Nuclear). 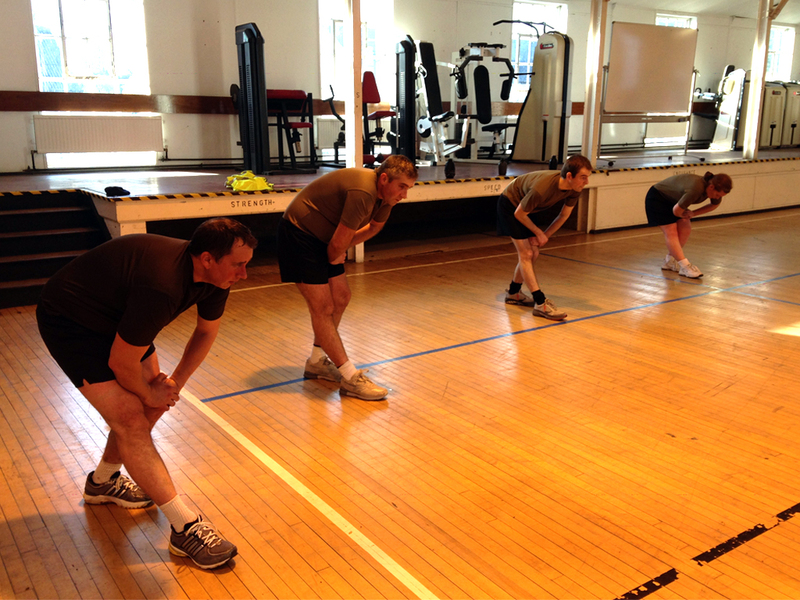 Saturday evening ended at about 19:00 with a session of circuits in the gymnasium. I made the mistake of eating too much at dinner and spent the whole session tasting blackcurrant cheesecake mixed with savoury rice! Another mistake I will never make again. 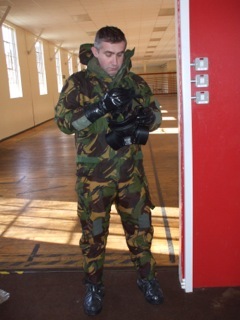 Warming up nicely in my CBRN kit. Sunday was a similar day to Saturday and there was a fair bit of hanging around waiting for lessons. We were in the classroom for a few early lectures and then we were off for our first shoot. The indoor range consisted of laser equipped SA80 rifles. They are tethered to a sophisticated machine that records exactly where your shots fall on the screen to your front. They are also CO2 operated so you get a good sense of the recoil that would be experienced when you get to fire the actual rifles. This was the first time that most of our course had ever shot a rifle and I was impressed to see how quickly everyone mastered the marksmanship principles that we had been taught. The idea is to create as small a spread of shots as possible on the target. Clearly, being able to shoot proficiently is an important skill for any soldier. I don’t think anyone on our course will have too many problems in this area! The finale of our six weekends was quickly upon us and we were all lined up ready for our three-mile TAB which had to be completed in 45 minutes to pass the test. We set off at the required pace and soon we were getting into the 15-minute-mile rhythm. Things began to get a little unpleasant when we turned off the nice tarmac road and headed for a muddy track around the perimeter of the base. The track is very hilly and had now had large puddles full of foul-smelling stagnant water! However, we all pressed onwards and soon we were heading for the finish line outside the gym. Then it was done. We all passed the TAB and with a little bit of course administration to complete, our six weekends came to an end. 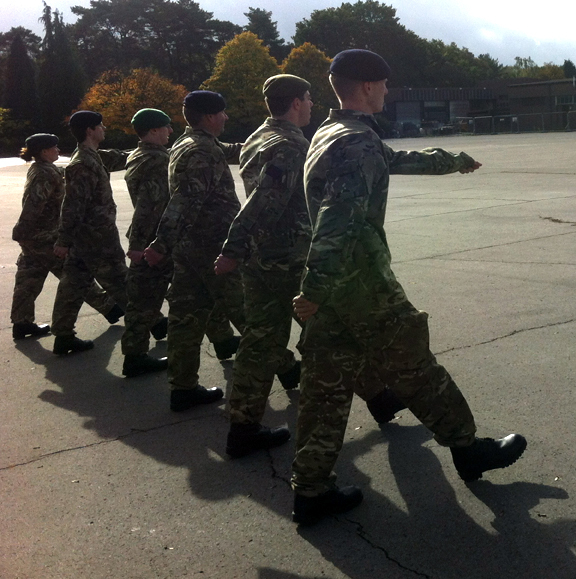 It felt nice to stand on parade knowing that we had completed the first phase of our Army Reserve careers. So now we can all look forward to TSC Bravo. I know it will be much harder and more demanding than TSC Alpha. However, we have had a tremendous grounding and we have had first class training. You hear many people say that the British Army is the finest Army in the world. Well, I can honestly say that if we continue to receive the standard of instruction that we have had so far, then I won’t disagree with that statement. I feel proud to have come through this phase of training and I feel fortunate to have had such capable and helpful instructors. My thanks to you all for helping a middle-aged man through some demanding days! As I look back I have to be honest and say that some of it was physically demanding. Some of it was mentally demanding but all of it has been thoroughly enjoyable. I am sure that each one of us has now found that we have different areas of strength as well as areas that require more work. I have learnt a lot about myself over the last few months and hopefully I can improve on my weaker areas in time for TSC Bravo. It is time for me to sign off. 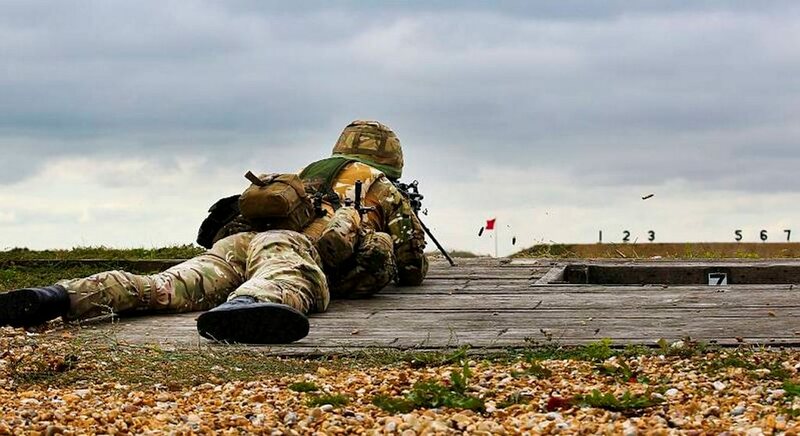 I hope that you have enjoyed my blog and I really hope that any of you who are thinking of joining the Army Reserve will now have a better understanding of this phase of training? All I can say is that if I can do it then so can you! Good luck. The team together at the finish. I hope that it is all okay? Thank you for the opportunity to write this blog over the last few months. I have enjoyed it very much. Also, a big thank you to all the staff at ATU South. It has been a very rewarding time for us all and we all feel confident that we are ready for TSC Bravo. It has been some time since my last blog just before Christmas. I should actually have completed all my Alpha phase weekends by now but the real world caught up with me and I was unable to attend the planned weekend 5 with my original course. That was a real shame but I wish them all the best of luck in their Army careers! You never know we may meet each other again in the future. Preparing for the day’s exercise with the new team. 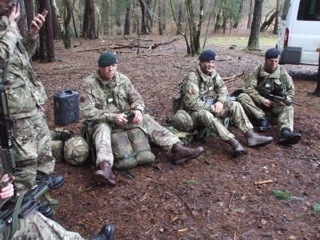 This meant that my actual weekend 5 would now be with different recruits and different instructing staff. I have to be honest and say that this wasn’t a position I particularly relished. The team dynamics are well established by weekend 5 and I did feel like I was imposing to begin with. Happily, we all got along and my course mates were very gracious in welcoming me to their course. Overall, I think we all had a very good weekend. The weekend was almost exclusively conducted in the field. Early Saturday morning we made our way to the exercise area and prepared for a long day of lessons. We learnt many new skills throughout the day form patrolling to preparing a ‘harbour’ area. Saturday finished with sentry duties throughout the night into early Sunday morning. Fortunately, the weather remained moderate which was fortunate as severe conditions had been forecast! Although, I did have to get up twice through the night to re-fasten our ‘Basha’ which was attempting to achieve flight in the high wind. Sunday morning started with kit packing, ration pack breakfast, and personal administration. We were each inspected to ensure that we met the high standards that had been set. We were then thrown in to fire and manoeuvre rehearsals and drills. This really is where the fun part of training begins. We were issued with several hundred rounds of blank ammunition which we happily disposed of in various scenarios. Sometimes storming as pairs, sometimes repelling as the enemy. Always good fun. It is physically demanding but really gives you a feeling that all the training is coming together and you are inching ever closer to becoming a real soldier. 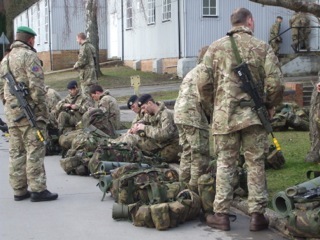 The exercise was stood down and we returned to Pirbright for the tedious part of the weekend…..cleaning the rifles! I would never believe that it could take so long and become such a huge undertaking cleaning one rifle. How wrong you can be! After countless attempts at getting the rifle passed by the assembled scrutinisers, I finally handed it back to the armourer with a huge sense of relief. Last thing to mention was the two mile TAB. For some reason this proved to be quite a struggle this weekend. Whether it was fatigue from the weekend itself, or just a lack of preparation, I can’t say. I did finish it but if I’m honest, and that had been the three-mile TAB on weekend 6, I would have failed. Not good at all. More work will be required over the next couple of weeks to ensure that I don’t have a repeat performance. The focus of Weekend 4 is most definitely around the weapons handling test. 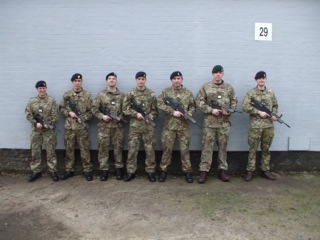 We spent most of Saturday learning and practicing the last of the rifle lessons in preparation for the test on Sunday. We had all grasped the majority of the drills but, as ever, the devil is in the detail. Whilst there is some room within the test for minor errors any more than this could result in a re-test or even a possible back course, as I understand. I am happy to report that all six (We lost one and gained two new members!) of us were successful in passing the weapons handling test at the first attempt. This is the first real milestone achieved so far in our Phase 1 training. The next real test is coming on Weekend 6 and that is the 3 mile TAB which, I discussed in my last blog. With this in mind I have been working hard, whilst away from the weekends, slowly building up my ability to carry load over longer distances. Hopefully, I shall be adequately prepared for the 3 mile TAB in a few weeks’ time. We also had several lessons on the values and standards expected from the modern soldier. I found these lessons particularly engaging. We were privileged to watch videos of soldiers who had carried out extraordinary feats of bravery whilst on recent operations overseas. We completed the obligatory PT sessions, from which I was till aching 3 days later! Although our PT instructor was gracious enough to tell us on the Saturday that we would be hurting for many days to come! In his words “At least I didn’t lie”. Yes indeed. Thank you for your honesty Staff. Looking ahead we have a few weeks break now before Weekend 5. This isn’t quite the blessing it first appears. It will take considerable motivation to not over indulge during this festive time. I am going to try and keep up the training over these weeks in preparation for the last 2 weekends. Moreover, I am now beginning to contemplate how challenging TSC (Bravo) may well be for me. However, best not to get too far ahead of myself as there is plenty left to do! It has been three weeks since my last weekend away and I have to be honest and say that my motivation levels were not at their highest. This is definitely something that you should consider when choosing to opt for the six weekends or the intensive two-week ‘Malta Challenge’. Whilst the weekends fit in better around my work commitments, they do require considerable self-motivation. After a long, and stressful, week at work it is very tempting to postpone a cold and demanding weekend away with the Army. However, it struck me that it is exactly at these times that you need to dig deep and show determination. The effort required to pass these weekends starts long before the Friday night! Even my elbows are sore! Weekend three seemed to consist, mostly, of Skill at Arms lessons. We spent so much time lying in the prone position on the classroom floor that everyone’s elbows began to feel the pressure. On a positive note we are all doing very well in this most important area. We have the Weapons Handling Test coming up on Weekend four, which is our first pass or fail test. It seems incredible, and a testament to our trainers, that we have learnt so much in such a short time. It does prove that the Army has developed a very effective tried and tested system for training recruits. Saturday’s physical torture (Sorry that should read physical training) was an introduction to the Personal Fitness Assessment or PFA. This consisted of as many press-ups and sit-ups in two minutes respectively followed by the mile-and-a-half-run. For the first time I actually didn’t feel too bad following PT, which was most welcome. Hopefully, my fitness and resilience levels are beginning to improve? Getting up to scratch for the Personal Fitness Assessment. On Sunday we had an introduction to ‘Tabbing’. This is a forced march whilst carrying a load. Our first foray was a two-mile march in boots and carrying the SA80. The speed at which you are required to march is just above that which is comfortable so it quickly starts to wear you out. 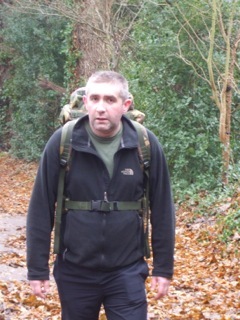 As we progress through the weekends we will have to complete three miles in 45 minutes whilst wearing full kit, carrying the bergen and the SA80. This forms the final test and is completed on Weekend six. By all accounts this is the area that can catch many recruits out. Whilst walking at this speed is unnatural for most, it is the introduction of weight that causes problems. I myself could feel ‘Hotspots’ on the heels of both feet even after 2 miles. I shall have to practice more at home and try to prevent these hotspots from forming blisters. Blisters are most definitely the enemy! Weekend 2 began in earnest on Saturday morning with a palpable change in tempo. We were introduced to a new Corporal who was far more vociferous than our previous. He barked his orders at increasing decibels until we adhered to the given instructions! That said, his depth of knowledge of the course content over the weekend was most impressive. The ability to do everything that it is required of you at a pace that seems ludicrous is something you begin to accept. There never seems to be enough time no matter how seemingly simple the task. This relentless pressure is applied from the outset and the expectation is that you will react instantly and without question. The subliminal lesson being taught is clearly a fundamental cornerstone of all military discipline. The group dynamics are slowly evolving and this is interesting to observe. We are becoming more comfortable in each other’s company and our true characters are beginning to come through. This is definitely a very positive experience enhanced by the occasional collective adversity! 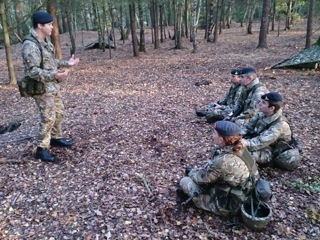 The emphasis of weekend 2 is centered around the introduction to Fieldcraft and your first night out in the field. As with everything else there are numerous lessons where every detail is explained and covered including what to pack, what to wear and even how to correctly wash yourself! The final briefing before our night in the field. The actual night in the field was a cold affair punctuated with being woken every 2 hours to carry out a relaxed patrol for an hour. It is fair to say that by reveille at 06:00 on Sunday we were all a little bit jaded. Sunday began with a three-mile steady-state run followed by drill and more weapons handling lessons. We are all becoming more proficient in handling the SA80 and are acutely aware that our weapons handling test is fast approaching. Again, throughout the weekend it was stressed how important fitness is in completing the weekends. We had inputs from both our instructors and the PT staff. These weekends are certainly action-packed with very little down-time but they are enjoyable. My Monday morning commute, following the weekend, has now become a reflective affair rather than the usual tedium. I like to consider what we have achieved over the weekend and that gives me a tremendous sense of satisfaction. My advice to anyone reading this who is unsure whether they should give it a try or not is ‘Don’t hesitate!’. Just remember to keep smiling and make sure you get your fitness levels up. That said it’s now time for my Wednesday run. Experience has taught me that the anticipation usually far exceeds the reality when confronted with stressful circumstances, or experiences, in my life. However, even when armed with this knowledge the long drive from Portsmouth to Pirbright had my stomach churning. Sharing the drive with me were two other recruits just about to embark on their two-week TSC (Bravo) course at Army Training Centre (ATC) Pirbright. I’m not sure who on the minibus was more quiet! I was dropped off at Brunswick Camp and made my way to the registration area in the drill hall. After a short wait I was escorted to my new home for the next couple of days. On entering the barrack block I was pleased to see several, equally startled, young men who had already claimed their respective bed spaces. It would be fair to say that the prefab buildings, making up Brunswick Camp, would not win a four-star rating in the Good Hotel guide. Then again, I didn’t think I would be sleeping or relaxing too much over the forthcoming weekend. We were introduced to our cadre staff, who all seemed remarkably pleasant and genuinely helpful. I hoped that this new-found friendship would last for the entire weekend that we were to be there! Breakfast was calling and then we would begin our lessons in earnest. 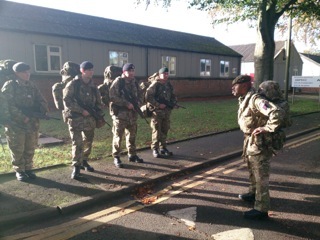 Our first introduction to drill on the parade square. We were told you do drill because “It’s good for the soul”! You quickly realise that that there is an awful lot of information for your grey matter to absorb and there is very little time in which to achieve this feat. I am 42 years old and pushing at the envelope of acceptability for the Army Reserve. The old adage of ‘teaching old dogs new tricks’ was resonating through my mind as the pace quickened throughout the day. The series of lessons undertaken covered a wide spectrum from learning about Military Law through to Health and Hygiene. We had to do our mile-and-a-half run and were introduced to the gymnasium and the Physical Training staff. I think all my fellow recruits would agree (Maybe with one 19-year-old, extremely fit exception) that PT strikes terror into the hearts and minds of most who tread the boards of those hallowed gyms. I need to work on my fitness or I am sure that the following five weekends may prove to be a very painful and somewhat uncomfortable affair. Our weekend finished much as it had begun with a disparate set of lessons culminating in a final PT session before we wearily boarded our minibuses for that long return journey home.